A group of ecumenical accompaniers from the World Council of Churches have shared Shabbat dinner with Jerusalem's Kol HaNeshama congregation whose people are seeking to reach out in the communities around them. "We believe all people are created in the image of God, and that religion comes after," said Rabbi Tamara Schagas as she recently welcomed the group of international participants in the WCC's Ecumenical Accompaniment Program in Palestine and Israel. The program that is known as EAPPI came from a call of the churches in the Holy Land to be there, observe and walk with the people they live with during a time of heightened conflict involving Israel and the Palestinian West Bank area that started in 2001. So, the World Council of Churches, which represents more than half a billion Christians worldwide, created the Ecumenical Accompaniment Programme in Palestine and Israel (WCC-EAPPI) in 2002. 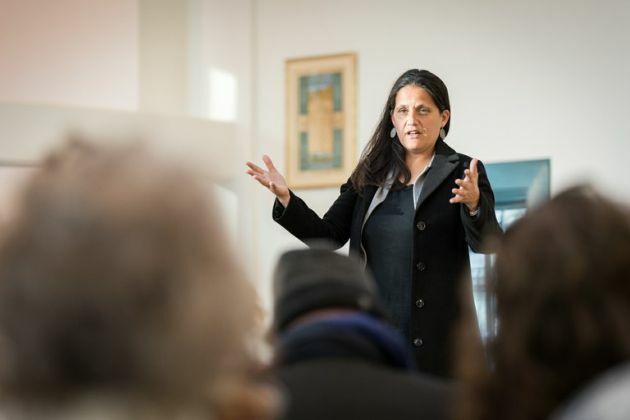 Schagas, a member of Kol HaNeshama, a reformed Jewish congregation of 350 families in Jerusalem, engages with EAPPI in her endeavors to reach out to communities around her. 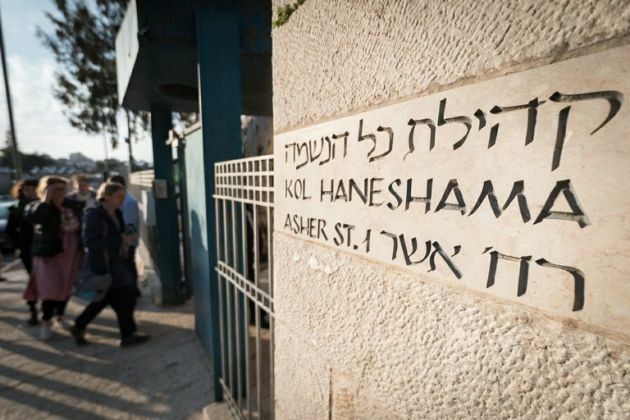 Kol HaNeshama works actively as a focal point for Jewish pluralism and social action in the area. Its congregants originate from Israel and from countries all over the world. Prayers are in Hebrew and prayer books are also available with English translation, as well as Hebrew transliteration. "We are all connected to what happens in Israeli society, and we see that we need to find a common language to speak to each other," says Schagas, an activist in Rabbis for Human Rights. "We welcome you into our community, our house of prayer to share with you who we are and the work that we do," she said to the accompaniers. Rabbi Schagas recites the Kiddush, the blessing over the wine, to sanctify the Shabbat. "On Shabbat, our prayers express thankfulness over the week that has passed, Schagas said. "We invite you to come and meet with us, and to rest with us." Pouring water three times over their hands, ecumenical accompaniers participated in the traditional Shabbat custom of N'tilat Yadayim, hand-washing before blessing the meal. The rabbi then sprinkled salt over the Shabbat bread, as a symbol of remembrance of the sacrifices that were once part of the Shabbat ritual. "Being at this Shabbat dinner was balm for my soul," said one of the ecumenical accompaniers coming out of the synagogue. "We spoke to an Israeli woman who was so wholeheartedly committed to the well-being of the Palestinians, and by that, of the Palestinians and the Israelis." "She's learning Arabic, she teaches Hebrew to Arabic nurses in East Jerusalem," she continued. "I think what it was, was that there weren't any ifs or buts, there weren't any limits on what the Palestinians needed to do to be acceptable, it was that this is what she needed to do to live in this country." "The dinner was really interesting," said another ecumenical accompanier, from Argentina. Seeing how a large part of the accompaniers' time is spent in placements across the West Bank, she reflected, "it is a big change, and a hard change, to try to understand and focus on an Israeli point of view. "I had to sit and really listen, and keep an open mind, and it wasn't easy. But also, I think it helps you to understand much more. We are a program to accompany both sides, the Israeli and the Palestinian people." "This was one of the highlights. We're sitting at a table with a psychiatrist and his wife who works in a bilingual Arab-Jewish school, and they are very politically active in a non-governmental organization working with Holocaust survivors... and we had a very lively discussion," reflects an ecumenical accompanier from Germany. "Being in the Palestinian territories... dealing only with settlers and with soldiers will give you a very monolithic image of Israeli society, so I think it's very necessary to humanize the other side as well," he adds. "If you are active on only one side, there will be a tendency to dehumanize the other side. But there are many people on both sides who are very helpful in our fight for human rights." "We need to be aware of this, and dehumanizing people on any side won't bring peace closer," he said. This is an edited version of a story that Albin Hillert wrote for the World Council of Churches. (Photo: Albin Hillert/WCC)Ecumenical accompaniers arrive at the synagogue of Kol HaNeshama.